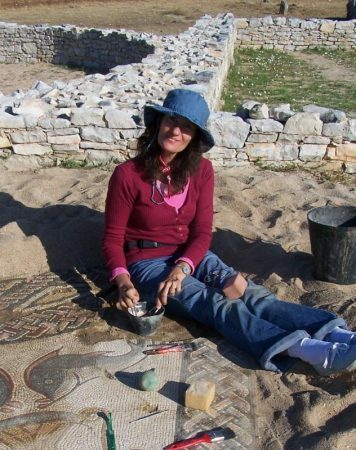 On Wednesday, April 10, Filomena Limão, a specialist in classical and late Roman art, will give a presentation at Randolph about architecture and mosaic decoration of the Late Roman Villa of Santiago da Guarda in Ansião, Portugal. The event is free and open to the public and begins at 7:30 p.m. in Room 537 of the Harold G. Leggett Building. Limão’s illustrated lecture is titled “The Late Roman Villa of Santiago da Guarda: Architecture and Mosaics in Living Palimpsest.” She works as a postdoctoral research fellow with the Instituto de Historia da Arte at the Universidade Nova in Lisbon, Portugal, and as coordinator of the academic project ENCONTRHARTE (Encontros de Historia da Arte Da Antiguidade). Limão holds degrees from the Universidade Nova, and her research interests are architecture, sculpture, painting, and mosaics in Classical and Late Antiquity, particularly those in Portugal. She also works on using innovative audio-visual media to provide a new view of Antiquity, and to allow greater access to scientific issues.